I’ve spent a lot of time in Europe, and nothing pisses me off more than stereotypes about the United States and Americans. For the most part, people are cool wherever you go as long as you’re cool to them but there’s also plenty of people on ‘The Continent’ that consider all Americans stupid, backwards, ill mannered, gun totin’ racists. The reality is that every country in the world has its good and bad elements and in that respect Europe is no different than America. 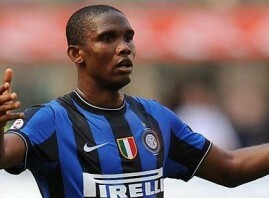 Cagliari’s Serie A home game with Inter Milan was suspended for approximately three minutes on Sunday because of racist chanting apparently aimed at Samuel Eto’o. In Rome, three men – reportedly Lazio fans and aged 20, 23 and 27 – were arrested for possession of dangerous weapon near the Olympic Stadium after an officer spotted a machete under a seat, ANSA news agency reported Sunday. Following a search, police also found baseball bats, knives, sticks, two clubs, a tennis racket and a ski mask. Emphasis added–the idea that a tennis racket is a dangerous weapon is very amusing to me and somewhere Jim Cornette has been vindicated. The whole experience teaches us a valuable lesson–not everything in Italy looks like a Vespa ad and if guns are outlawed thugs will roam the street swinging tennis rackets. “I didn’t hear any such chants. I absolutely did not hear them”.